Skeptical Science is a great website that debunks global warming deniers. But their home page has a box counting up the amount of energy trapped by greenhouse gases in units of Hiroshima atomic bomb energy. While strictly correct, in the sense that the amount of energy released by the horrendous, genocidal attack on Hiroshima, Japan, on August 6, 1945, the equivalent of the explosion of 15,000 tons of TNT, is the same as that accumulated at Earth's surface every fourth of a second by anthropogenic greenhouse gases, I find that this trivializes the horror of nuclear war. I am not writing this to criticize global warming theory. I have been doing climate research for 40 years, since Professor Edward Lorenz recommended the study of climate as a Ph.D. topic for me in 1974. In 1978 I published the first transient climate model simulation of the warming response to increasing CO2 (Internally and externally caused climate change. J. Atmos. Sci., 35, 1111-1122). And I often explain the problem in the 10 words of Yale's Anthony Leiserowitz: "It's real. It's us. Scientists agree. It's bad. There's hope." But we do not need to shock and mislead people with the effects of nuclear weapons to solve this problem. 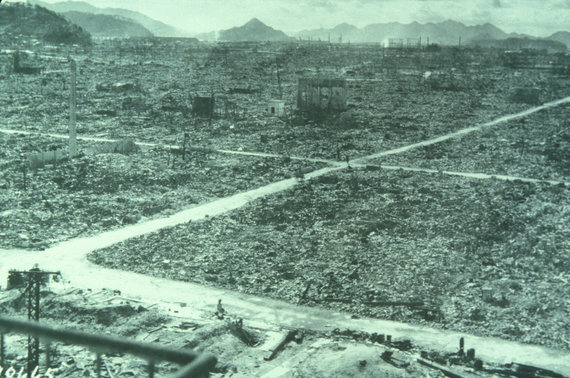 Hiroshima after the nuclear attack. The buildings burned, producing smoke. Multiple attacks, with much larger current bombs, could produce devastating global cooling. Nuclear bombs do more than release thermal energy, and their potential impact on climate far outweighs anything else humans could do to our climate. The blast, fires, and radioactivity would kill millions of people if dropped on modern cities. The direct casualties from just three weapons of the size used on Hiroshima, exploding on U.S. cities would cause more casualties than the U.S. experienced in World War II. But the smoke from the fires would cause the largest impact on humans. I described the climatic effects of nuclear war and the continuing nuclear winter problem in a previous Huffington Post blog. To summarize, the current Russian and American nuclear arsenals can still produce a nuclear winter, with temperatures plummeting below freezing in the summer, sentencing most of the world to famine and starvation. Even a war between two new nuclear powers, say India and Pakistan, could put a billion people could be at risk of starvation from the agricultural impacts of the smoke from the fires that could be generated. Nuclear weapons are useless. They would never be used on purpose by the major powers, but could be used by accident. Some countries might use them in a moment of panic, or in response to imagined threats and insults, or in a fit of religious hysteria. The arsenals of nuclear weapons states set a bad example for the world, encouraging proliferation. And they could kill us all. Now that President Obama is feeling freer to do the right thing, rather than spending hundreds of billions of dollars to modernize our nuclear arsenal, he can rapidly reduce it, to make the U.S and the world safer, and to save us money for much more productive uses. The time is now to ban nuclear weapons so we have the luxury of worrying about global warming. For more information on this topic, click here and watch my 18-minute TEDx talk, here.